Be among the first to experience what The Herbal Chef, Christopher Sayegh, #1 Cannabis Infusion Chef in the world, has to offer with HERB at EMERALD EXCHANGE’s “SUMMER OF SUN-GROWN” a Cannabis Farmer’s Market & Wellness Festival in MALIBU, CA. LOS ANGELES / MALIBU, CA – HERB, a first-of-its-kind cannabis restaurant by The Herbal Chef™ Christopher Sayegh, will make it’s debut this August 12th and 13th in a series of dinner and brunch dining services at the fourth installment of Emerald Exchange [“EmEx”] “The Summer of Sun-Grown”, a cannabis farmer’s market and wellness festival. Michelin trained chefs leave behind the stuffy confines of the classic kitchen and re-imagine a new style of fine dining, featuring a 5-course meal comprised of fresh produce, outstanding culinary talent and a full sensory experience for the canna-curious foodie. After years of trial and error, edible after edible, The Herbal Chef team brings EmEx guests the perfect balance of cannabis and cuisine as part of a sneak preview to HERB, the first ever brick and mortar cannabis restaurant slotted to open in the LA-area late 2018. In a captivating atmosphere, this multi-course duet of THC-infusions by Jetty Extracts and gourmet food with kitchen setup by Julabo, all takes place outdoors on a scenic, 17-acre ranch in Malibu, California. Cannabis flower is provided by 3C Farms along with cannabinoid (CBD) water. Emerald Exchange guests will choose from four separate dining services as festival ticket add-ons including Saturday Dinner at 6 p.m. & 8 p.m. and Sunday Brunch at 11 a.m. & 1 p.m. With full bellies and relaxed bodies, guests will be asked to partake in a post-dinner ‘Decompression Lounge’ sponsored by Fontera and Get Higher Beauty – a concept that will be implemented with playful luxury at the future HERB restaurant – which helps ease the mind and balances everyone before sending them back out into the festival environment (or world) to experience everything else Emerald Exchange has to offer. In a rapidly growing industry (U.S. cannabis sales expected to hit $22.8 billion annually by 2020), Christopher Sayegh continues to change the landscape for cannabis-infused cuisine worldwide. Sayegh and The Herbal Chef team played an active and vocal role as new CA recreational cannabis regulation was being put forth in efforts to pave way for the HERB restaurant reality. Not only is The Herbal Chef creating a dining experience that is completely new to the culinary world, the team is also setting an industry standard across the globe for what a cannabis restaurant should be. From the systems of operation, to the care of each and every guest, the attention to detail is unprecedented in what can only be known as a landmark in culinary revolution. Defining the future of elevated ‘Pot Culture’, Christopher Sayegh joins fellow cannabis entrepreneurs and EmEx co-founders Justin Calvino of the Mendocino Appellations Project and Michael Katz of EVOXE Laboratories, along with partner and event producer Jessica Cure of Cure Designs. Emerald Exchange originated from the collective vision of likeminded cannabis lovers and entrepreneurs who wanted to create experiences that not only empower small businesses and promote mindful communities fostering sun-grown organic product, but also celebrate the rich history of the Northern California cannabis movement; simultaneously penetrating mainstream, popular events with a new paradigm and perception of cannabis being fostered today. 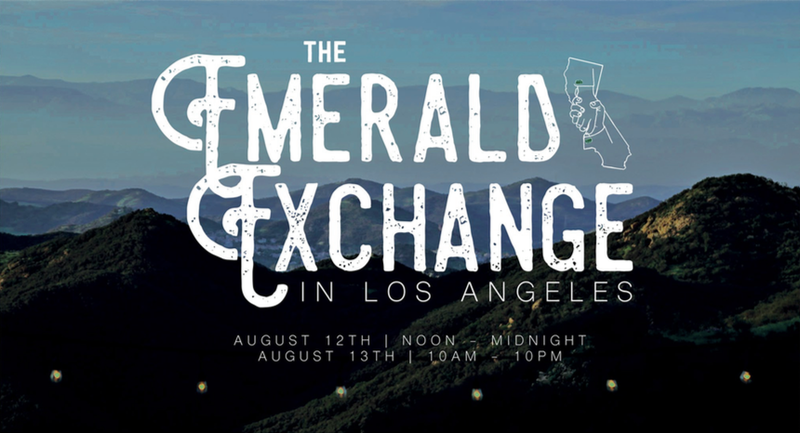 For additional interview opportunities with the founders of Emerald Exchange and The Herbal Chef team, imagery from past events, and information on how to obtain VIP media passes to the August 12th/13th EmEx event, contact press@emeraldexchangeca.com. About Christopher Sayegh, The Herbal Chef ™ – A walking brand full of charisma and charm, Christopher Sayegh, The Herbal Chef, has pioneered Cannabis Infused Fine-Dining to elevate the perception of Marijuana into mainstream media. Dinners include a synergistic blend of art, music, fine wine and top notch ingredients, simultaneously educating his audience and effortlessly entertaining at the same time. Currently, Christopher is producing a brand of gourmet edibles and frozen CBD and THC-infused dinners, as well as offering catered and private dinners. With the innovation of the ready-made frozen THC/CBD infused meals and the two television shows being produced about The Herbal Chef, Christopher has already been able to solidify his space as the #1 Cannabis Infusion Chef in the World. Science minded biology student turned to the chemistry of food and herbs to feed the intellectual side of creation. Chris is eager to share his brick & mortar cannabis restaurant vision with the world – HERB by The Herbal Chef ™. For more information, please visit www.theherbalchef.com, or follow The Herbal Chef on Instagram @the_herbal_chef. About Emerald Exchange – The innovative and exquisitely curated Emerald Exchange brings together Cannabis advocates, cultivators, investors and patients on a scenic country, Malibu ranch to elevate the cannabis consumer experience and business potential. Peruse a Cannabis Farmer’s Market featuring Northern California sun-grown cannabis cultivators to enjoy a variety of products, discover new approaches to health and education at various workshops and EmEx speakers series, and partake in a Tasting Panel led by co-Founder Justin Calvino. After sunset, wind down the day of professional development, educational exploration, and amplified wellness by enveloping one’s self in the evening magic of Malibu canyon – musical beats featuring various DJs, musicians and other performance artists. Guests spend the day connecting with cannabis products, health & wellness brands, education visionaries, emerging leaders and patient communities amongst the rustic, natural beauty of Malibu at this new age-conference styled 2-day event.